Duke Snider was only a part-time player for the Dodgers in 1962. He played in 80 games that year and hit five homers. But after the season ended he was in fact traded to the New York Mets. That must be when this card's owner marked the transaction on the card. 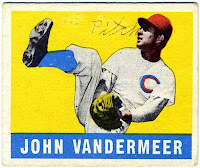 For some reason or another, there are a lot of poor-condition cards of Snider out there. Before starting this blog over a year ago, I owned no Snider cards. I now own three. This 1962 Topps, a 1959 Topps and a 1957 Topps – all in pretty-bad shape. With a little searching on eBay, I can probably find an Ex condition version of this card for about $20. But I'll take this poor condition card any day. Complete with a kid's scribbles. Warren Spahn was a 12-time, 20-game winner in the Majors – 1953 being no exception. In '53, Spahn went 23-7 with a 2.01 ERA. It was the first year for the Braves in Milwaukee. Yet Spahn is wearing his Boston hat in this card. At least Topps didn't Photoshop his cap – of wait, there was no Photoshop in 1953. I got a chance to see Spahn about a year before his death. I was in Cooperstown during induction week. He was across the street sitting at a table signing autographs. He was frail and old – unlike the young man in his prime pictured in this card. I didn't matter, I will always cherish the fact that I once saw, with my own eyes, the greatest lefthander to pitch in the Majors. About a week ago I had the urge to go to a local baseball card shop and look around. I figured I might be able to find a few cards I can post on the old blog. When I walked into the store I explained to the owner that I was looking for poor old baseball cards. I said that I would prefer star players but any old cards would do. This is usually where the owner looks at me a bit funny and offers to show me a small box of overpriced star players from the 50s, 60s and 70s. But this store was a bit different. The owner immediately pulled out three boxes of Hall-of-Famers and stars to look through. And each card was in worse condition than the next. It was heaven. You know that saying about being a kid in a candy store? Well, I was Charlie and this was my Chocolate Factory. Among the cards I went home with were: two 1971 Thurman Munsons, a 1958 Eddie Matthews, a 1962 Duke Snider, nine 1948 Leafs and this 1972 Reggie Jackson. By the way, Reggie was $1. Boy, I am looking forward to the next time I have a sweet tooth. Jack Barry was the shortstop in Connie Mack's $100,000 infield. He — along with Stuffy McInnis at first, Eddie Collins at second and Frank Baker at third – were the highest paid teammates of their day. They were kind of like today's New York Yankees infield except Alex Rodriguez, Derek Jeter, Robinson Cano and Mark Teixeira make more like $75 million. The investment seems to have paid off for the Philadelphia Athletics with World Series championships in 1910, 1911 and 1913. All-in-all, Barry played on seven American League pennant winners in his 11-year career. After his playing days in the Majors were over, Barry had a distinguished career as the baseball coach at Holy Cross. He served as coach for 40 years compiling a 616-150-6 career record. For the longest time I thought this was one of those "special cards." I didn't realize it was Aaron's regular-issue card for 1974. As the No. 1 card in the set it is a nice tribute to the New All-Time Home Run King. Then I looked at the back. At the end of 1973, Aaron had 713 homers, one shy of tying Babe Ruth and two short of becoming the king. It wasn't until April 8, 1974, that Aaron would surpass the Babe. 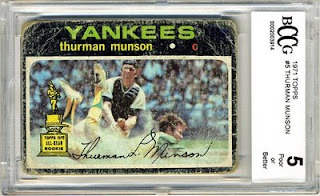 Did Topps prematurely inaugurate Aaron the Home Run King? Was this card produced in a series that was made after the season started? I know someone out there knows the answers. Grover Cleveland Alexander is tied with Christy Mathewson for third-most wins in the majors. His 373 victories are only surpassed by Walter Johnson (417) and Cy Young (511). Yet unlike Cy Young, Walter Johnson and Christy Mathewson – I bet most baseball fans have never heard of him. I remember seeing a baseball movie called "The Winning Team," starring a young Ronald Reagan as Alexander. I was just a kid, but I took an interest in the story about the ballplayer who served during WWI that came back to the States with a ton of issues. Alexander suffered from shell shock and had his share of problems with alcohol. It is said he would often pitch while hung-over. One of the most amazing things about Alexander is that he won 20 or more games in a season nine times. He won 30 or more three times. He also won the pitching triple-crown (leading the league in ERA, wins and strikeouts) in 1915, 1916, 1917 and 1920. This is by far the worst graded card I have ever seen – let alone own. Why would someone submit this card for grading? By the way, it wasn't me. I know, your probably asking," Submitting it is one thing but how could someone pay money for that thing?" I plead guilty to the later. It makes for a great conversation piece. Can't you see the expression on the face of the professional grader when he or she pulled this beauty out of the envelope? And when the submitter received the card, I wonder if they were thrilled when it scored a 5 (Poor or Better). Do you have a graded card that is worse than this? I'd like to hear your story. As a teen in the mid-1980s, this was the baseball card to have. I probably pulled a half-dozen of these from wax packs back in the day, but I found this one at a local baseball card shop yesterday. I got a chance to see Rickey play on a regular basis when he joined the San Diego Padres in 1996 and again in 2001. He was an easy pick to become a Hall-of-Famer later this year. He may be one of the Top-10 baseball players ever. He changed the game and was a dynamic player and personality. Are you kidding me? Two consecutive no-hitters. Vander Meer accomplished the feat in 1938. On June 11 he allowed no hits against the Boston Bees (Braves). Four days later he did the same against the Brooklyn Dodgers. What's even more amazing is that he did it both times on the road. Apparently the Reds wanted him to change his uniform number to "00" after the accomplishment. He never did. The back of this cards advertises a 12" x 6" pennant from any National or American League team. All you had to do was send in five baseball card wrappers and ten cents. Alright, I know I overpaid for this card. It was $12. But as the author of a blog titled "Poor Old Baseball Cards," how could I resist. Good ol' Duke is split right down the middle. That's not a heavy crease, that's a tear. It's barely hanging on. It's nearly two halves. It's still a sweet baseball card. And if anyone were to ask if I would rather have 12 brand new 2009 baseball card packs or this torn piece of cardboard ... well those of you who read this blog regularly know the answer. I'd take this 1957 Duke Snider every time.